Vanilla ice cream sundae with hot fudge drizzled on top = all of my vegan food dreams come true. This vegan vanilla ice cream sundae is probably theeee most delicious vegan dessert, ever. I love this recipe so much because I get to enjoy a childhood favorite but without any of the guilt. 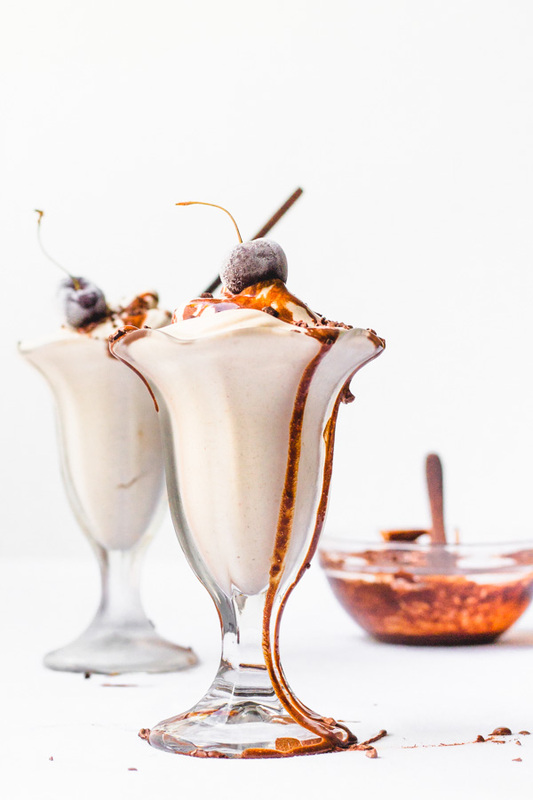 This vegan vanilla ice cream sundae is free of refined oils, dairy, refined sugar, gluten, and most importantly, no animals are hurt in the making of this amazing dessert. Super WIN!!! The only regret I have is not having shared this one with you guys at the beginning of summer... I was being selfish, and wanted to enjoy this delicacy all to myself - but then I came to my senses - you guys deserve to enjoy this delicacy, too. 😛 Totally just kiddinggg - it's been a busy summer. As much as I hate to admit it, this recipe was inspired by a very large (and definitely not healthy) fast food chain restaurant which shall remain nameless... this place had theeeee best ice cream sundaes ever, and they were definitely a childhood favorite of mine. One day after seeing a picture of this childhood obsession I had a light bulb light up inside my brain - why not recreate a healthier version! Doiii! And so I did ... it definitely took a few tries - and then i had to decide if i wanted to go with a caramel sundae or a hot fudge sundae, and friends.. although the caramel version is great.. this hot fudge option takes the big cake. cashews - if you do not have a powerful blender I'd recommend that you soak your cashews overnight or at the very leasttt for 30 min to an hour in very hot water. light coconut milk from a can - it's important that it's milk from a can, those tend to be creamier than carton coconut milk which is wayyy watered down. I always use light and I find it to be creamy enough but feel free to try it with the regular version (but pay attention to the amount of fat!) My favorite canned coconut milk brand is the 365 Whole Foods brand. vanilla - preferably for that super duper vanilla flavor you should use vanilla pods or vanilla paste.. but if you don't have those around (i definitely don't) you can also use vanilla flavoring or pure vanilla extract. The best vanilla flavor I've noticed is using vanilla pods. dates - soft and chewy are best, if yours are on the drier side just let 'em soak for a few minutes before blending. You can also skip the dates and just sweeten it using your preferred natural sweetener. agave or your preferred liquid sweetener. and some water to bring it all together. You can enjoy the fudge as is to keep it raw, or heat on the stove for just a few minutes until it begins to bubble for a delicious hot fudge version (my favorite!!). If you want to serve it like a sundae with the 'swirl' then you'll need a piping bag with a very wide tip. This is the piping bag that I use, and this is the very wide piping tip that works for sundae-like ice cream swirls. Both are available on amazon. 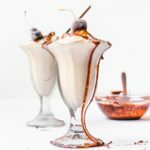 This vegan vanilla ice cream sundae is so delicious that I wanted to make sure that everyone could make this recipe, even those without an ice cream machine maker. Now, let's be honest for a second. Having an ice cream machine maker at home as a vegan is a great investment because you get to make creamy delicious ice creams at home. I use this ice cream machine from cuisinart (affiliate link) and it is pretty affordable (under $45 at the time of this posting), very easy to use, and I find myself making lots and lots of different flavored ice creams like this vegan papaya ice cream (so gooood). Having an ice cream maker also means you get to enjoy this sundae immediately vs having to freeze the mixture over night or for 6 to 8 hours.. But - if you do not have an ice cream maker - no worries!!! I did some research for you on different ways to make ice cream at home without a machine and I found a way that works with this sundae. All you have to do is blend the mixture and then freeze it into ice cubes overnight. The next day all you have to do is blend the frozen cubes up (i used a food processor but a blender should work, too) and then there you have it - creamy dreamy ice cream. All right friends - that's all for today - enjoy the ice cream lovelies! Want to see more healthy vegan dessert recipes? Check out this oil free strawberry crumble bar or this very berry and mango frozen dessert bars.